You may not think that there is a right and wrong way to drink and serve Champagne, however the Champagne aficionados of the world tell us otherwise, and with International Champagne Day on the 19 of October… we thought we’d better share! You don’t need to wait for a special occasion! But you can add champagne to any occasion to make it extra special. Champagne is that delicious sparkling white wine that we all associate with a celebration – a new promotion, an engagement or a milestone birthday, and some of us even to celebrate the end of the week! At this temperature the smell and taste of the wine can be fully appreciated. As a general rule of thumb, experts advise that a vintage bottle of French bubbles should be served at 12 degrees Celsius, and a non-vintage bottle at 8 degrees. To achieve the required temperature, you can place an unopened bottle in an ice bucket (half ice and half water), for 20 to 30 minutes. Or refrigerate it for 3 to 4 hours. To allow aeration, your favourite Champers is best served in a wide flute allowing it to breath. Rather than popping the cork, try releasing the cork with a sigh. To ease the cork out, hold the bottle away from you (and anyone else! ), at a 45 degree angle. Place the mouth of the bottle closest to the first champagne glass to be filled (no wasting of precious bubbles if it doesn’t go to plan!). Hold the cork and gently turn the bottle in one direction. (Make sure to turn the bottle and not the cork). Tilt the glass when pouring to minimise the foam. Be sure to hold the bottle correctly. 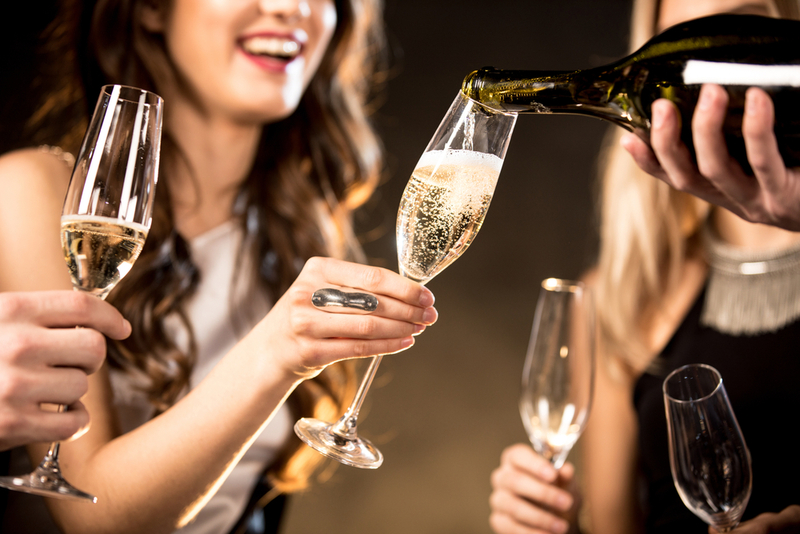 The correct way to hold a bottle of Champagne when pouring is to balance the base firmly in one hand with the thumb in the punt (the inverted dimple at the bottom of a bottle) and spread your fingers out along the barrel of the bottle. Once poured, any remaining champagne in the bottle should be placed back on ice until finished (in one sitting). Cheers, or as they say in Champagne …. à votre santé!